Oh no way! The Cardinals just signed Edmonds! Isn’t he 40 now and has been hurt constantly for the last two years? Well he could help be a leader and a left-handed bat off the…oh wait. He just retired…never mind! With the weather being as nice as it is, everyone rock the half-shirt on Saturday in honor of Edmonds…it’s either that or go to his restaurant, but its a little expensive and a lot douchey. Jimmy Ballgame never even made it in to camp. So that’s that. Edmonds signed just enough of a contract to retire as a Cardinal, and in that respect, maybe it was worth it. 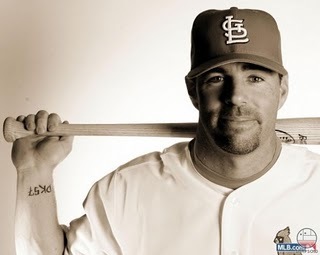 A quiet end for Jim Edmonds. The club will make a fornal [sic] announcement at 10:30 a.m. (St. Louis time). A formal announcement? Jimmy never even left his house and you’re going to make a formal announcement of his retirement?! That Jim Edmonds, dramatic to the bitter end. In our mind, Jim grabbed his bags and walked out to his car for the airport and then dramatically fell to the ground because of his ankle, threw his bags in the air, rolled on the ground, caught his bags, and then laid there for a second while his family looked on and then winced and stood up before jogging back to his house with one last tip of the cap. Also, high-five to John Jay who managed to dodge the “old veteran Tony would have totally picked over you” bullet.